I am always on the hunt for new math apps to use for class, and I’m particularly happy when I find some that are simple and effective. 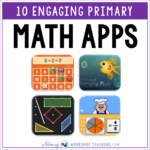 I recently attended a professional development session about math apps, and I’ve collected the most popular ones for primary classrooms. These were recommended for K-2 classrooms, and they are between $0-$5. Click on the name of each app to see more information.